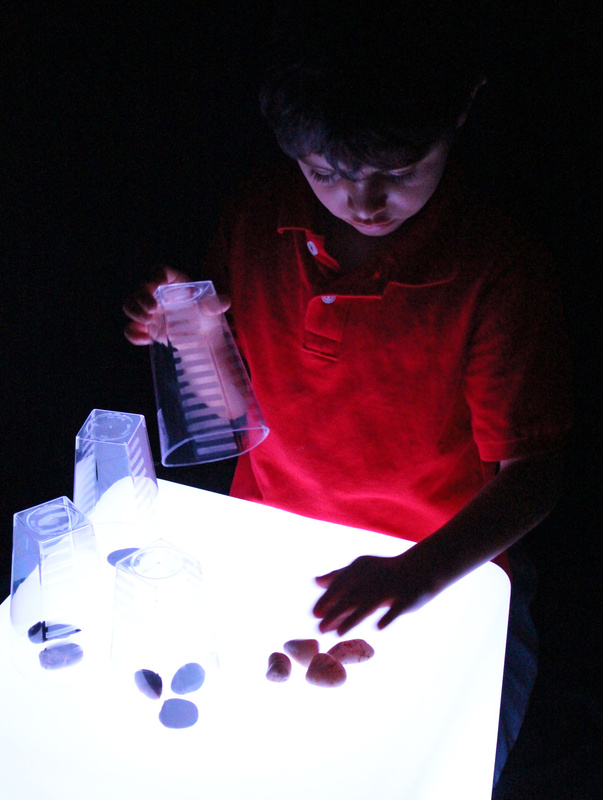 The Light Cube is a great medium for learning math lessons! Instead of the same old boring tabletop math activity, take it one step further with light-enhanced materials. 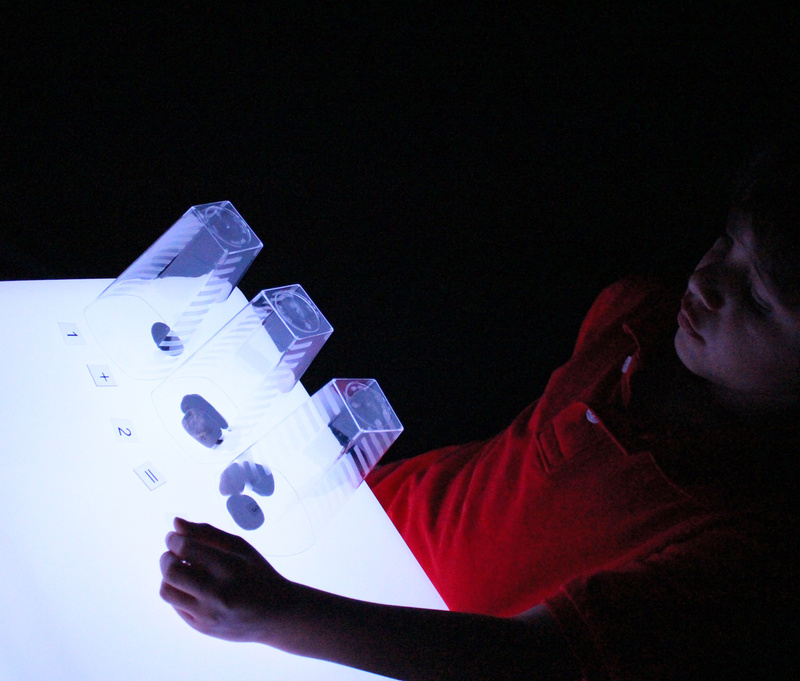 Everything looks better with light, that’s why we’ve made our math lessons extra-special on the Light Cube! We brought an older student, John, in to see the Light Cube for the first time. Before turning it on, however, we told him that he would be going through some math exercises. John immediately looked at us like he didn’t want to have anything to do with math! 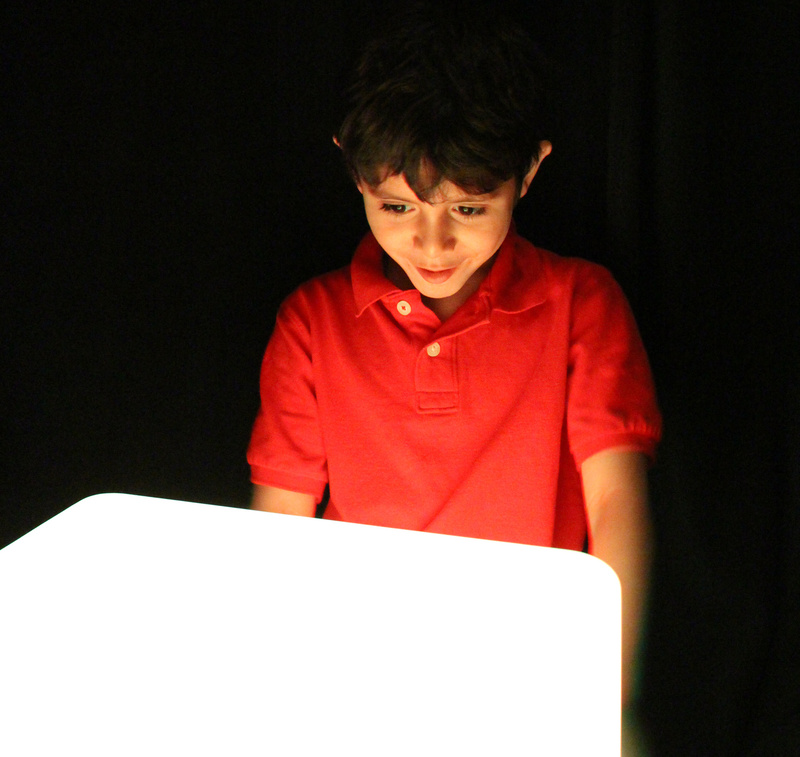 But as soon as we turned the Light Cube on, his expression completely changed, and we grabbed a great photo of his reaction! So, we got started! 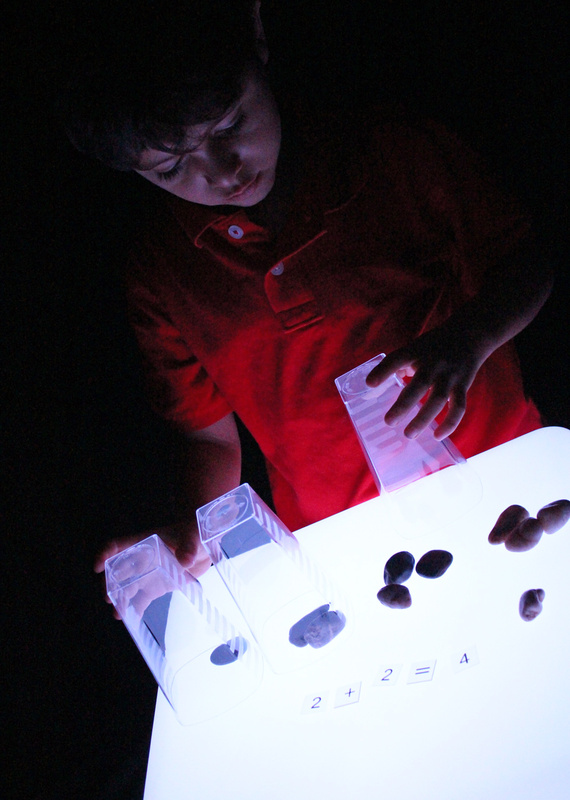 We placed a few clear color cups and garden rocks we picked up at the Dollar Store onto the Light Cube. John was entranced by the way the light shone through the clear cups, but the rocks completely blocked out the light, meaning that they are opaque. It was great to talk about the differences between items, to learn about transparent or semi-transparent versus opaque objects… and a great boost to children’s vocabulary! We placed clear numbers and operations onto the table. Above, we organized the number sentence to say 11 – 5 = ? We asked John to take 11 garden stones, then remove 5 from the main pile to a separate pile and count the remainder. To complicate the activity a little bit, we decided to incorporate the clear color cups. We separated the stones into 4 piles, starting with 1 stone in the first pile, 2 stones in the second pile and so on. John secured each of the piles separately by placing the clear color cups on top. Once we posed a number sentence to John, he immediately redistributed the stones inside each cup to match the given numbers. He compiled the final amount of stones into a single cup. We counted and found his answer to be correct: the number 8! What’s the answer to this one? By this point, it was pretty easy for John to figure out. 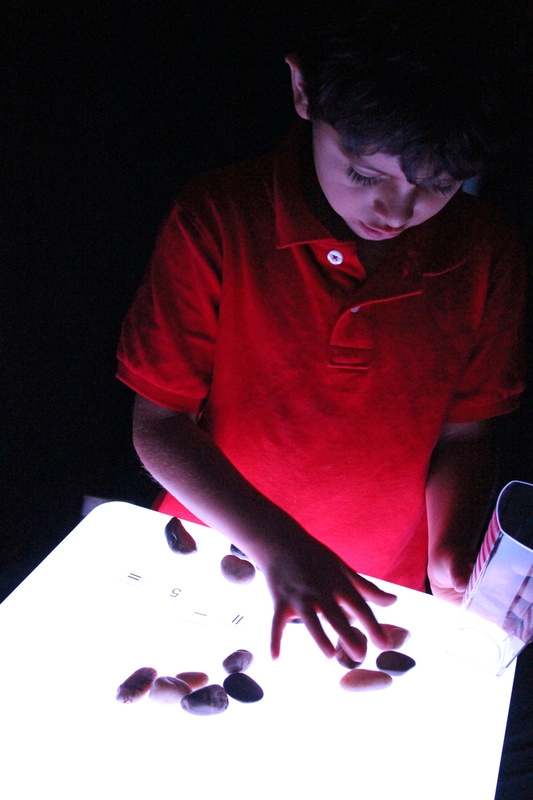 We had a lot more fun than we’d thought learning math on the Light Cube… because it puts things in a whole new light! 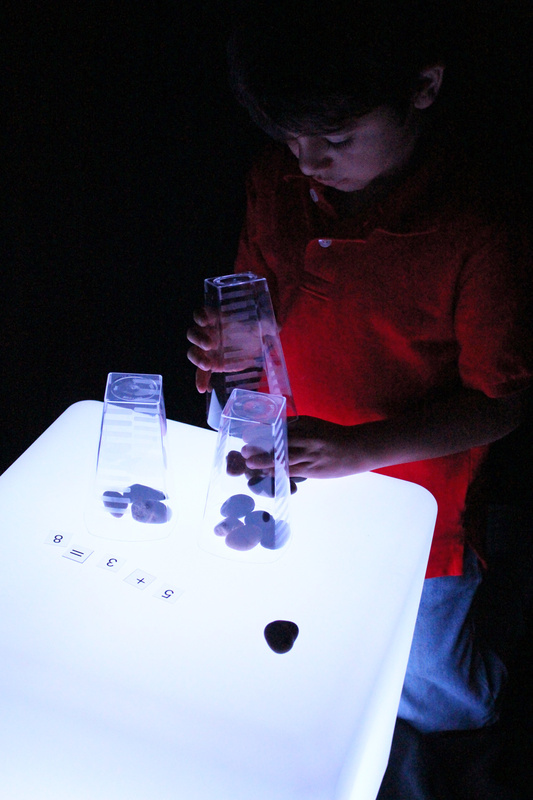 This entry was posted in Math and tagged counting cups on light cube, educational light cube, how to make math interesting, introductory math for kids, light box, light play, light table, math light cube, math light cube learning, number sentences, transparent objects on light table by roylcoblog. Bookmark the permalink.